Morning. :) Sooo, I'm sure you're all wondering how my first professional set went on Saturday night. Overall, it went very well. But like all things in life, it had its pros and cons. A learning experience to be sure. I think that the most eye opening thing that I learned is that dancing in a restaurant is SO, SO different from dancing in a hafla or any other dance performance show. For the most part, people don't go to the restaurant to see you dance. They go to the restaurant to eat and drink and they happen upon you. "Oh wow, there's a...belly dancer here." Which I thought was pretty funny. Do people usually bring swords to dinner there? We headed back to our Official Glamorous Belly Dancer Meet Up Spot: the large stall in the ladies room. Claire and Amy were set to dance first, followed by a short break, then me, with Claire taking the final set of the night. I helped Claire and Amy get ready and positioned myself to get photos of them. There were people there, but the restaurant wasn't really that full as Claire started to dance, and I was hoping it will fill in more as the evening wore on. The way the restaurant is set up is that there are 2 separate rooms. The bar where you first come in, and the dining area. Each has a large open spot in the front to dance in. Claire started in the dining area and then swooped in with her wings of isis to the bar where I was stationed. I realized that taking photos of a dancer in motion is no easy feat. As she finished up, Amy and I hustled to the bathroom with her for a pow wow. "Ok ladies, this is a bit of a tough crowd, especially in the dining room. 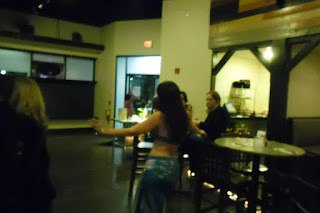 Lots of couples on dates and the women don't seem too happy about the belly dancing. In this situation, pretend the men aren't there and just dance for the women." Oh gulp. A tough crowd? As if my stomach wasn't already hurting with anxiety. Claire also mentioned that the crowd dynamic was "a bit of a dud." She assured us that this is just part of professional dancing and not to take it personally. But that a lot of the people there weren't too interested in watching dancing. Oh sigh. Then it was Amy's turn. She looked lovely, and had her family there, which was cheering her on. Her set went really well, especially in the bar where her family was, who applauded her enthusiastically. She also acquired a happily rowdy table of little old ladies in the dining room. Everything went great, and I was terribly happy for her. Barely anybody else was watching me. Amy was watching, as was her family and Claire, and they were all smiling. But everybody else at the bar? Drinking. Watching the overhead television set. I swirled my little heart out to not much fanfare. I headed into the dining room. Eh. A few people watched me, but there was lots of disinterest here as well. I moved to the center of the room for my veil envelope, and I will say that my veil behaved itself. No mishaps. But I was feeling a little crushed. Claire had warned us about this, but I couldn't help it, I was taking it personally. I headed back into the bar for my sword number. The instant I picked up the sword the crowd suddenly came the life. The little girls knew I was dancing with a sword and were all excited on the bench and at the bar, men suddenly took notice. And wouldn't you know it? The f-ing thing did not want to stay on my head. Practice with the sword? Flawless. Performing with the sword? Complete panic filled 10 seconds of trying to get it balanced. And naturally, this is when everybody wanted to watch me. The good news is that I did ultimately get it balanced and everybody seemed to love it. I told myself what Claire always reiterates to me, which is that it's actually GOOD for it not to look too easy to get your prop balanced. If it takes you a few extra seconds it reinforces that it is in fact difficult to do this and makes the audience more engaged. I repeated that to myself as I balanced away. I was planning to spin with my sword balanced, but I tossed that idea right out the window. I wasn't pressing my luck. It was on my head and I undulated away. I did turn with it, just not quickly. I also managed my hip drops and some torso work while balancing on one leg which seemed to be a real crowd pleaser. Halfway through the song, I had to take it off my head to move back into the dining room, and as I left, I did get a genuine round of applause. But could I enjoy it? No, because I was too busy beating myself up for the rough balancing beginning. It's not easy being Type A, I tell you. In the dining room, I got it balanced quickly with no trouble at all. But did anybody in there care? Not so much. A handful did. I quickly identified a couple in the back of Indian descent who seemed very enthusiastic and interested. I bookmarked them for a future visit. After my sword song, I had a fun pop song lined up, and by now I was feeling the sweat. I danced into the bar. A few people watched me, and I danced over by Claire and company who cheered me on. The little girls had cleared out and I missed them. I headed back into the dining room and made a beeline for the Indian couple. They were very into it and I danced there for a spell. I forced myself to move on and there were only a few other tables with people at them. One or two people didn't seem to know what to think about a belly dancer, but they did watch me and smile awkwardly. The others didn't look up from their hummus. I just had my drum solo to go, and my finale. I moved to the bar. That too had now cleared out a good deal. But I love drum solos, and damn it, it was GOOD. I accented my little heart out, incorporating in Khallegy style hair flips which Amy's family seemed to appreciate. I could see Claire beaming with pride, but I couldn't help it. I felt deflated. The only way to get the others at the bar to notice me again would have been to take my top off like so many people seem to think belly dancers do anyway. Oh sigh. 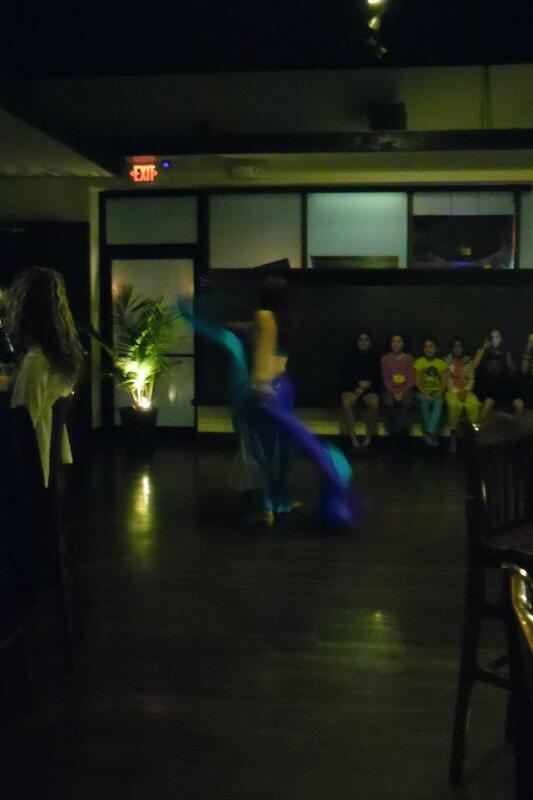 I got applause as my drum ended, but not from any of the non-belly dancing crowd that I could see. I swirled into the dining room for a final sweep and then step-balled-changed into the hallway and then the ladies room to wipe the sweat off my face. I felt like a balloon with a slow leak. Claire came over to tell me that I did a great job, but I couldn't help it, I felt disappointed. I think my expectations were just too high. I wanted to get drunk on the crowd energy and feel all floaty and fantastic, and that just didn't happen. There was NO crowd dynamic whatsoever. They were just...there, for the most part. Claire danced her final set and by this point the place was dead. She looked drop dead fabulous and danced like she had the attention of the entire Cairo Hilton ballroom. She's a true professional. As I watched her, I sat by myself and felt even sadder that I didn't have Mike there to comfort me. I had a hard time sleeping that night, but the next morning after Mass and a large cup of coffee, I began to feel better. Claire wrote Amy and I a beautiful missive about how well we did, and said that despite the utter lack of audience energy we looked like we were having a great time, which made me feel a lot better. She said that the owner of the restaurant remarked to her that she couldn't believe it was the first time either of us had danced professionally, that we looked so comfortable and at ease with it. They were both very pleased with our dancing and felt that we should feel great about it. After some reflection, I realized that she was right. The night wasn't the stuff of fantasies, but I danced my heart out, and I know that I did a great job. I can't say that I'm looking forward to doing it again, but chances are the next time it will be better because I will know what to expect. Plus, I'm going to drag my family there and their support will help quite a bit. And one of these times, I'll have a great audience and it will be one of the best dancing nights of my life, I just know it. I think that professional dancing is a lot like teaching and even Children's Liturgy of the Word. Some occasions will be fantastic and meaningful, others will be so horrible you go home and cry, and others will fall somewhere in-between. Part of becoming really good at what you do is accepting all of those occasions as part of it and learning from them all. So here I am Monday morning, still feeling a hair vulnerable, but also feeling like a belly dance success story. I am shy. I am a wife and mother. 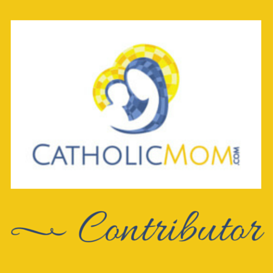 I am a devoted Catholic. I am significantly older than 18. But I'm also a belly dancer, and I love it and it brings me joy. 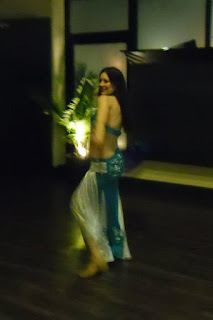 And what would the belly dancing life be without some good stories? I got some loud, drunk guys at a bar to watch me balance a sword on my head while I belly danced. Could it get any better than this? Good Lord, yes. But the best is yet to come. Way to go! I think you look awesome!